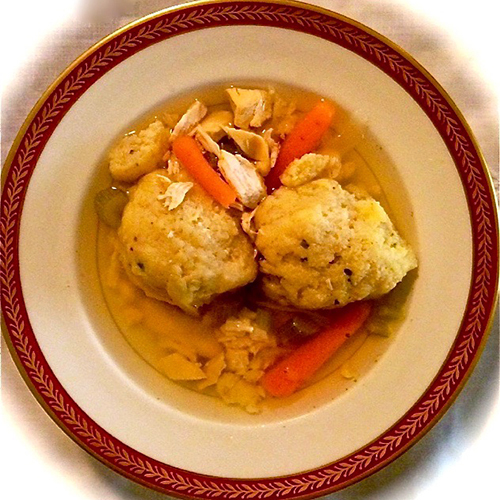 Chicken Matzo Ball Soup is considered Jewish comfort food with the popular nickname of “Jewish Penicillin” because it is the soup that can cure anything! Just ask any Jewish Mother, and they will tell you their recipe is the best version which of course is made with love. Chicken matzo ball soup also happens to be the traditional soup served during the Passover Seder holiday. The matzo ball dumplings in the soup represent the unleavened bread that the Israelites ate during the eight days journey when they escaped slavery from ancient Egypt. For this recipe, instructions are provided to cook on the stovetop and the Instant Pot pressure cooker. Ellen Easton shares this recipe as part of her Passover Seder dinner menu. Matzo balls are also known as knoedel or knoedela which was a European tradition that Germans, Austrians, Alsatains, and the Polish used in their soups. These dumplings were made from the leftover crumbs of matzo bread. In the 1930’s, the Manischewitz company in the United States, which produces and sells kosher foods, began packaging and selling them as “Alsatain Feathery Balls.” It is believed that Jewish vaudeville comedians started dubbing them as “Matzo Balls.” The texture of the matzo balls can be light as a feather and float on top of the soup or denser causing them to sink down the soup. Many refer the matzo balls as either “floaters” or “sinkers” and the topic is of much debate on which is preferred. 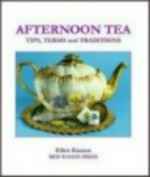 *For homemade chicken broth see recipe for Traditional Jewish Chicken Soup. Place all ingredients in a bowl and mix together. Store in a container, preferably with a dual shaker with an easy to spoon out top. Store in a cool, dry place until ready to use. In a large pot over medium heat, add the chicken broth, celery, carrots, onion, chicken, seasoning mix, and parsley. Stir together and bring to a boil. Reduce the heat to medium-low and let simmer for 30 minutes. When the chicken turns white, remove from the pot; dice or shred into small bite size pieces and place chicken back into the pot. Keep on a low heat. While the soup is cooking, prepare the matzo balls. See Matzo Ball recipe and instructions below. Reheat soup mixture over medium heat until boiling. 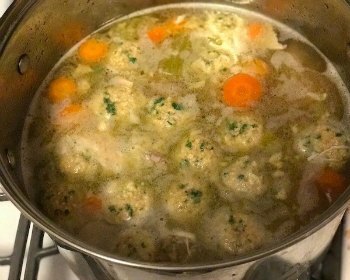 Drop matzo balls into a pot of boiling soup. Cover with a lid and reduce heat back down to medium-low. Let simmer until matzo balls are thoroughly cooked, about 30 to 40 minutes. (Do not open lid to disturb the matzo balls or soup during this time). Salt and pepper the soup to taste. Serve soup while warm. Ladle 2-3 matzo balls with chicken soup into each individual bowl. Garnish each bowl with fresh parsley or dill and enjoy! Add the chicken broth, celery, carrots, onion, chicken, seasoning mix, and parsley to the inner pot and stir everything together. Cover with a lid and close the lid to the sealing position. Make sure the pressure valve is also closed to the sealing position. Press the Manual button and adjust to a High-Pressure setting. Next, set the cooking time for 15 minutes. When the cooking time is finished, let the pressure naturally release until you see the pressure float pin drop (this should take about 15-20 minutes). Open the lid and set aside. Remove the chicken from the inner pot; dice or shred into small bite size pieces and place chicken back into the inner pot. While the chicken soup is cooking, prepare the matzo balls. See Matzo Ball recipe and instructions below. Drop the matzo balls into the inner pot with the chicken soup. Note: Make sure not to overcrowd the matzo balls, you need to leave room for expansion while they steam in the pressure cooker. Keep in mind, they will double in size when done cooking so make sure there is room for them to grow! You can freeze extra matzo balls to use another time. (You can probably fit 9-10 uncooked matzo balls in a 6 quart Instant Pot, about 12 matzo balls should fit in an 8 quart Instant Pot.) Cover with a lid and close the lid to the sealing position. Press the Manual button, and adjust to a High-Pressure setting. Set the cooking time for 15 minutes. then quick-release the remaining pressure. You may need to cover the pressure valve with a towel to catch any liquids they may spurt out. Salt and pepper the soup to taste. * If making homemade chicken broth, rendered chicken fat (or schmaltz), is the layer of fat that thickens at the surface of the broth after it has cooled down. Scrape the fat off the surface to use in the matzo ball mixture or wrap in plastic to freeze for later use in recipes like homemade biscuits instead of shortening. In a small bowl beat eggs; add oil (or schmaltz), Manischewitz® Matzo Meal, Reva Paul’s seasoning mix, and chopped parsley. Gently blend together. Add broth or water and mix until uniform. Cover mixture and chill in the refrigerator for about 20 minutes to 1 hour (the mixture will thicken up). Matzo Ball Freezing Tip: You can freeze the cooked matzo balls for later use. Place the matzo balls on a cookie sheet and place in the freezer uncovered for one hour. After the matzo balls are individually frozen, you can then place them in a resealable freezer bag to store in the freezer for up to 6 months and they will not stick together. When ready to use, let the matzo balls thaw to room temperature before adding to the soup stock. Turned out brilliant! Loved the taste, the ease of making it and just about everything about it! I’ve never had good success making Matzo ball soup in the past so I was happy to finally have something good and hearty that cooked in such quick time. Yay!! Happy girl here!! Thank you for the recipe!